This year, Boss has been releasing new stompboxes at a prodigious pace: two at Winter NAMM and three at Summer NAMM. All are reinventions of older Boss pedals. 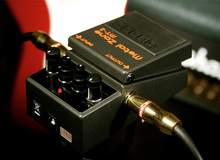 The DS-1X, released along with the OD-1X in January, is a revamped digital version of the DS-1. How does it compare to its predecessor? We tested them head to head as part of this review. On the occasion of our recently published Palmer Mutterstolz distortion pedal review, your favorite website decided to revisit some of the German brand's Root Effects, and here we review Automat, an analog distortion/auto-wah that saw the light of day in February 2012.